I have had many questions on the Skate Park project I have been doing in my classroom! 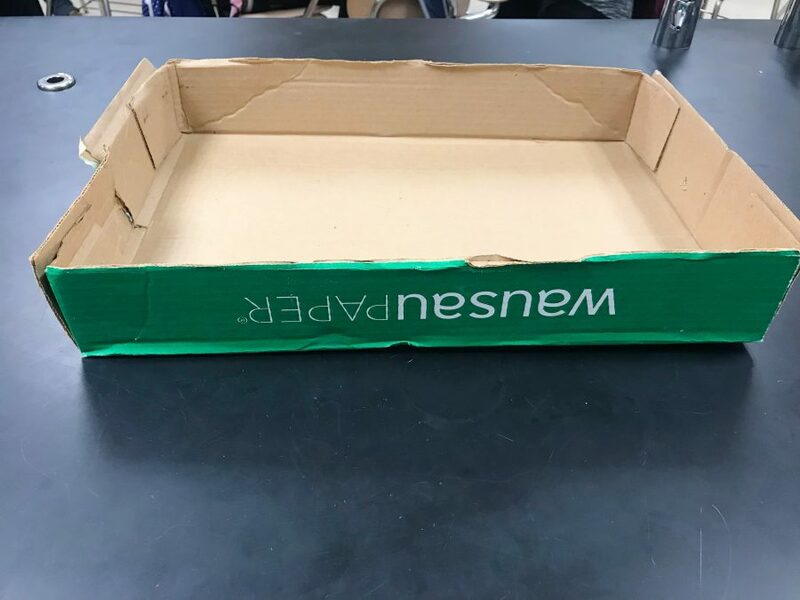 In short, the students create a skate park completely out of cardboard that a marble “skater” goes down to investigate kinetic and potential energy! Their marble has to go from start to finish without touching it! To see videos, check out my “Science” story highlight on Instagram! The Skate Park project that we do in 6th grade science is one of my favorite projects we do all year! This project is a part of our Energy Unit. I teach 6th grade physical science. Through this project, we assess our students on the application of kinetic and potential energy, as well as the transfer of energy. I teach in Illinois where we use the Next Generation Science Standards (NGSS). 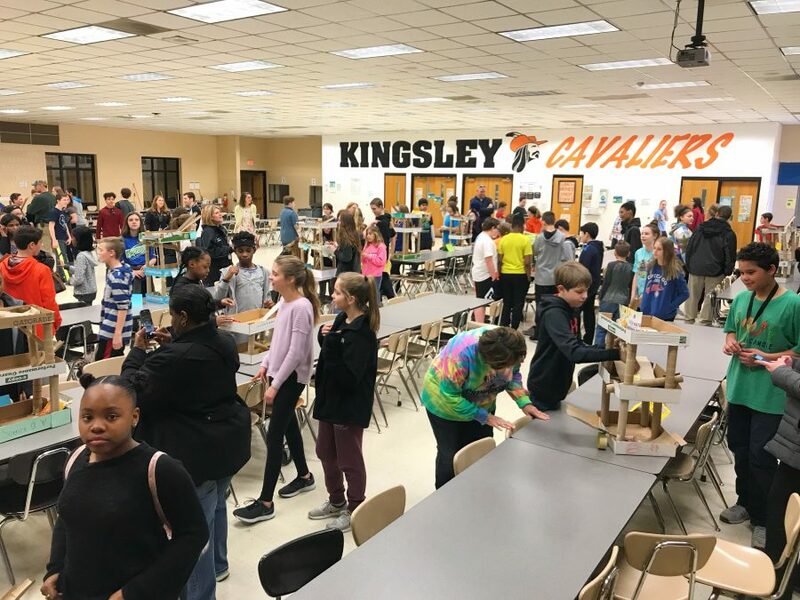 Prior to completing this project, the students learned all about kinetic and potential energy. I will soon make a blog post on resources for teaching kinetic & potential energy. This project was their final assessment on these topics. 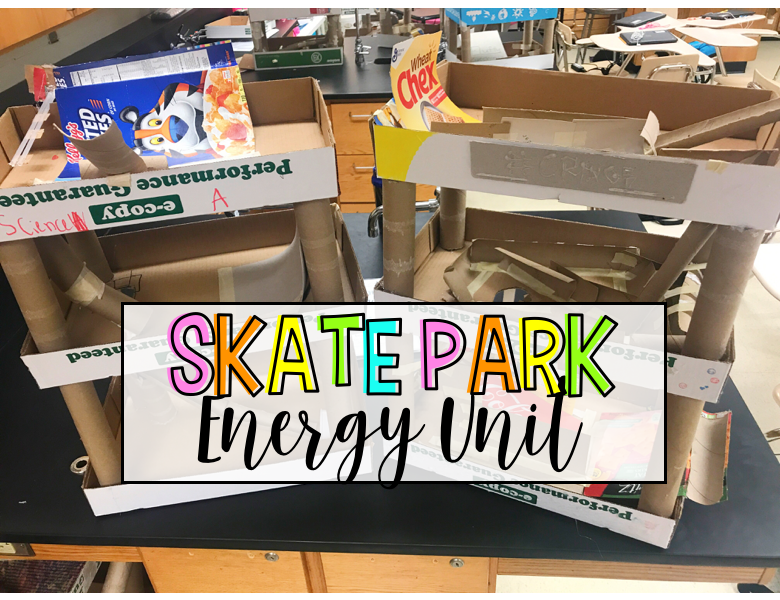 Rather than a traditional test, the students had to apply what they had learned about energy to create a successful skate park. They were also required to discuss the science behind their skate parks. The unit purchased through my district comes with a wide variety of instructions on how to build various obstacles. It also includes investigations on the science behind each obstacle. 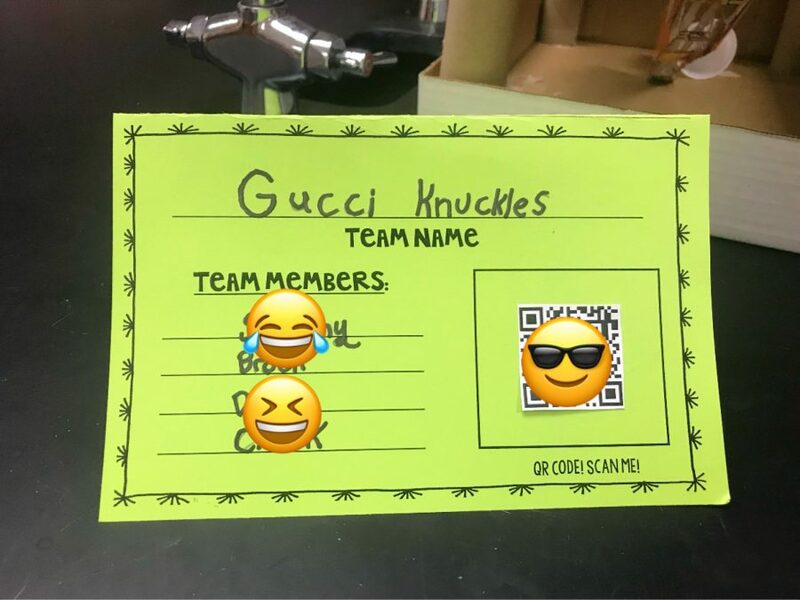 The unit includes roles for each group member, logs for students to record their daily accomplishments, recording sheets for investigations, and more. We do complete the entire unit but have adapted it over the years to fit specifically to our class. Copy box lid that serves as the base of every level. We complete this entire project and it takes us approximately 4 weeks from start to finish. Without all of the instructions on building various obstacles, you could cut this down to 1-2 weeks! As previously mentioned, we complete all of the “pre-building” activities that come with this unit. This includes how to build various obstacles such as street spines, half pipes, full pipes, and more. 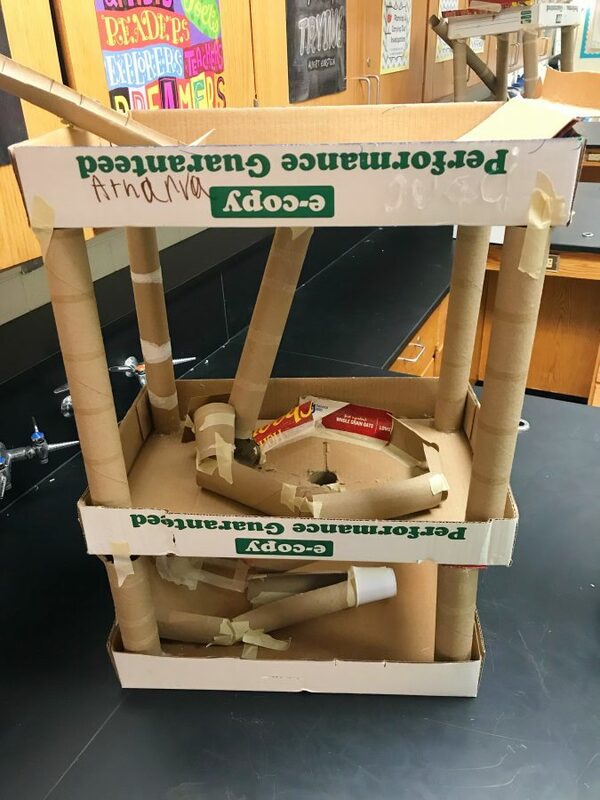 After we have learned how to build a few obstacles and done investigations on the science behind them, we give the students about 5 full class periods to build. They start with a copy box lid and pretty much have free range on how they want to build the rest. I do put a limit on the amount of levels they can have, which is 3! I swear they would be up to the ceiling if I didn’t limit them!! The only other requirement is that their marble has to end up in a cup at the end! After the students have completed their skate park and it is successful, they complete a short worksheet asking about the science behind their park. They have to discuss where their park has the most kinetic and potential energy, who is in their group, what obstacles their group has, etc. Once they have completed this, they go and create an audio recording using the website Vocaroo.com. This is a great tool and acts like a radio recording device! Once they are done, they have an option to turn it into a QR code! I print this out & the students glue their QR Code of their voice recording on a sign that they put in front of their park! When their parents come to watch their Skate Park, they can scan the QR Code to listen to their child and their group talk about their park! It is hard to provide opportunities for families and parents to come into our classrooms in middle school. This is an opportunity for the students to show off all of their hard work and for the parents to see what they have been doing for the past month! This was our third year doing the expo and we have a greater turn out every year! Our expo is in our cafeteria and we invite families, teachers, other grade levels, and administration to all come and look at the Skate Parks. The students set up their parks and their signs with the QR Codes. It is a very casual walk-through of the parks. In the background, I have a video playing of every group’s park with a pictures of the group! The expo lasts around 30 minutes. I highly recommend asking parents to come in to look at these! They always comment on how this is all they have been hearing at home for the past few weeks and it is nice to see them in person! They are very appreciative! Every Friday I have the students complete a peer-evaluation of their group members. They rate every member, including themselves, out of 4. They also have to comment on why everyone earned that score. I then look at all of them and determine a grade based off of my evaluation of them throughout the week. The students are in groups that they choose, so they are usually with their friends. I am always SO SHOCKED at how honest they are!! They really call their friends out or admit that they were not working how they should have been. I use a rubric to grade their park once they are done. I grade on: fluidity, smooth transitions, great variety of obstacles, marble is able to go from start to finish without touching or moving it, and marble moves safely throughout. This is where their science knowledge comes in. I assess on their ability to identify kinetic and potential energy in their park, where it has the most of each, the transfer of potential to kinetic, and their reasoning behind all of it. 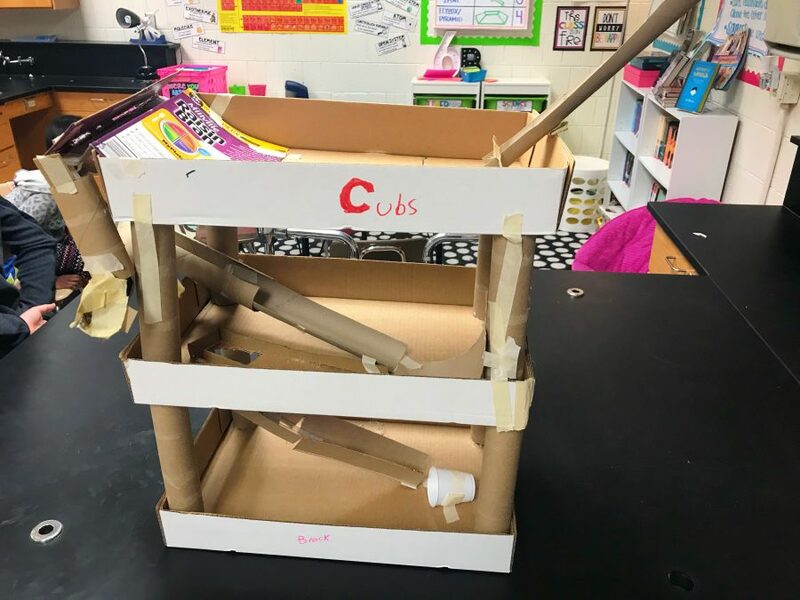 I would highly recommend using this project to teach and assess kinetic and potential energy! 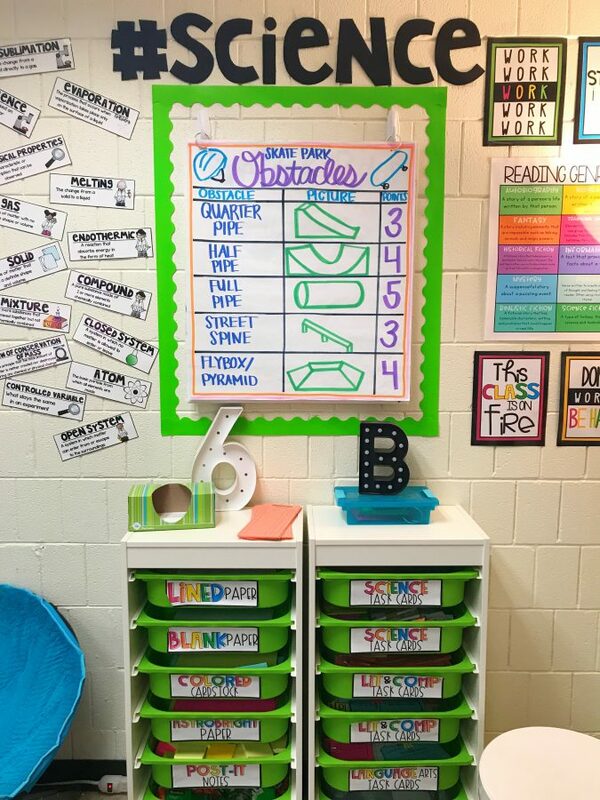 You can totally use this project in your classroom without purchasing the unit. This unit just includes tons of amazing resources to go along with the project, but is not necessary in completing something similar with still all of the science and educational benefits! You could totally shorten this into a 2 week project of just having the students build a skate park & creating QR codes! Since this original project is not mine, none of these items are on my Teachers Pay Teachers! 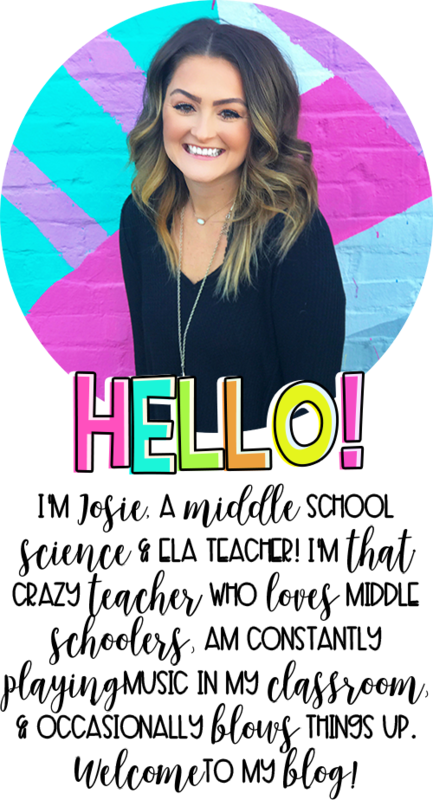 My hope was that I could go into enough detail that you could complete this project in your own classroom just by this post! Let me know if you have any questions! I would be happy to help! Do you have the Newton’s law activities on your blog? I am super interested!!! This a great idea. Can you share your rubric that you used to grade the projects?